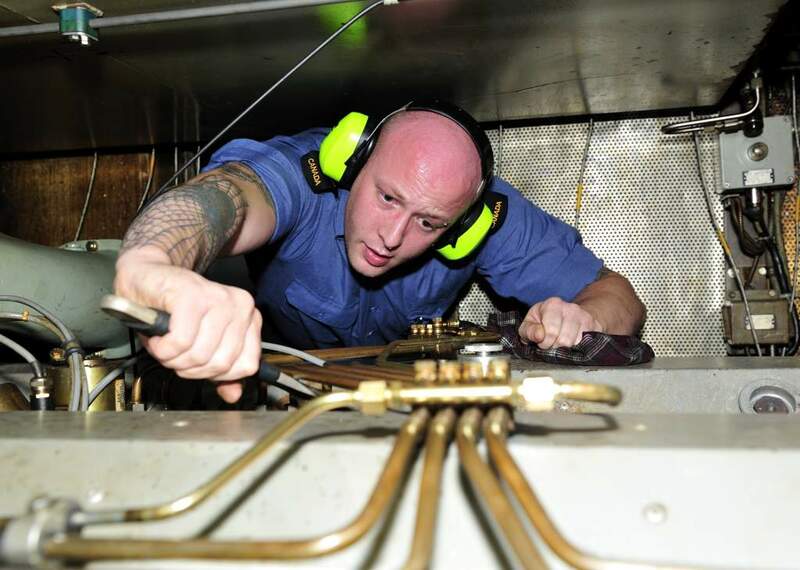 Able Seaman Brent Hellier conducts maintance on a diesel generator onboard HMCS Charlottetown. Hillier’s main task on the ship is to perform engineering rounds. “While on watch, I travel between various engineering spaces below the main decks to ensure that all engines and auxiliary equipment are running correctly,” said AB Hillier. In a typical day, engineering roundsmen work two or three four hours shifts. 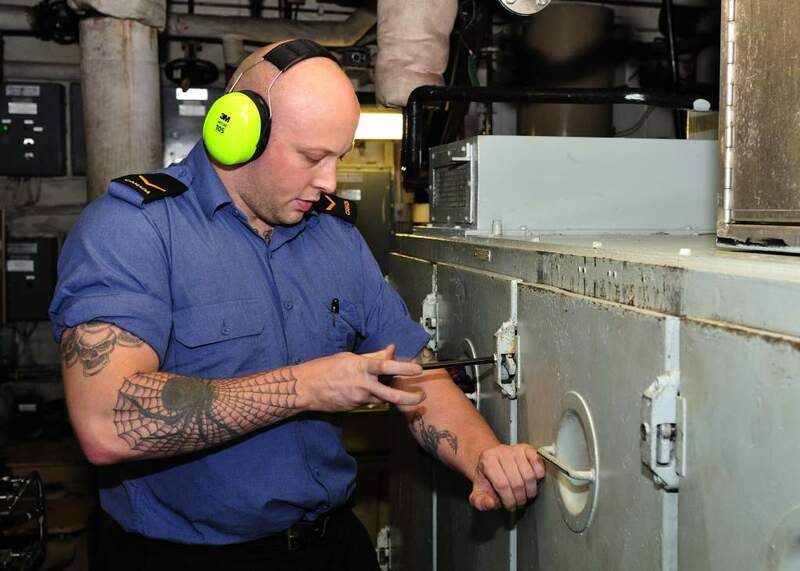 Able Seaman Brent Hillier check the oil of a diesel generator onboard HMCS Charlottetown. When not on watch, there’s often routine maintenance and corrective maintenance to help with. If he’s not doing that then you’ll find him studying to write his Auxiliary Machinery Operator Certification Level 1 exam, which he will write this week. In addition to his watches, ship maintenance, and studying, there are also meals to be eaten, physical training to be done, and everyone has to take a turn doing jobs that help keep the ship running on a day to day basis such as scullery or laundry. 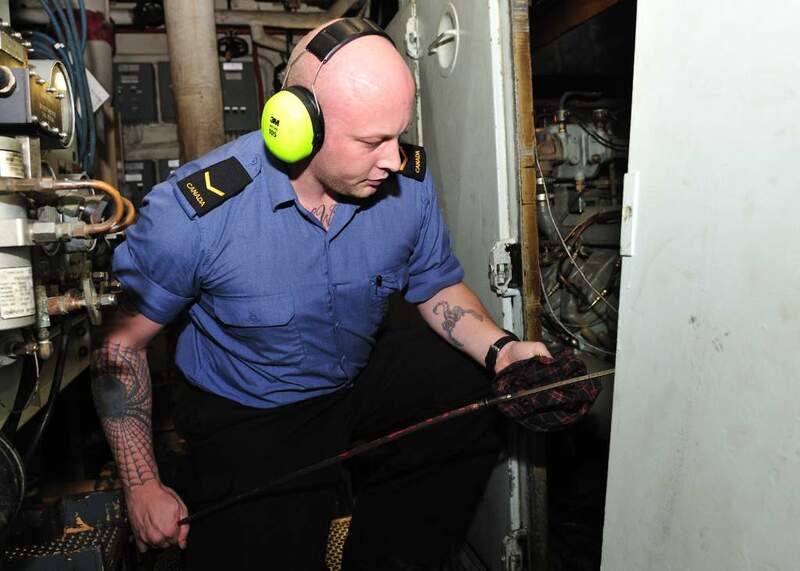 Able Seaman Brent Hillier removes the door of a diesel generator for maintance onboard HMCS Charlottetown. HMCS Charlottetown deployed from Halifax, Canada, on January 8. From January 24 until April 20, she operated with NATO allies participating in Operation ACTIVE ENDEAVOUR (OAE) in the Mediterranean Sea. In May, Charlottetown changed her area of operation and began working with Combined Task Force 150, one of three Task Forces within Combined Maritime Forces (CMF). CMF is a 26 nation naval partnership, which exists to promote security, stability and prosperity across approximately 2.5 million square miles of international waters covering the Arabian Gulf, the Gulf of Oman and the Indian Ocean; an area which encompasses some of the world’s most important shipping lanes.